Scribble drawing and story by Ivan Levy, 2016. Reprinted with permission. 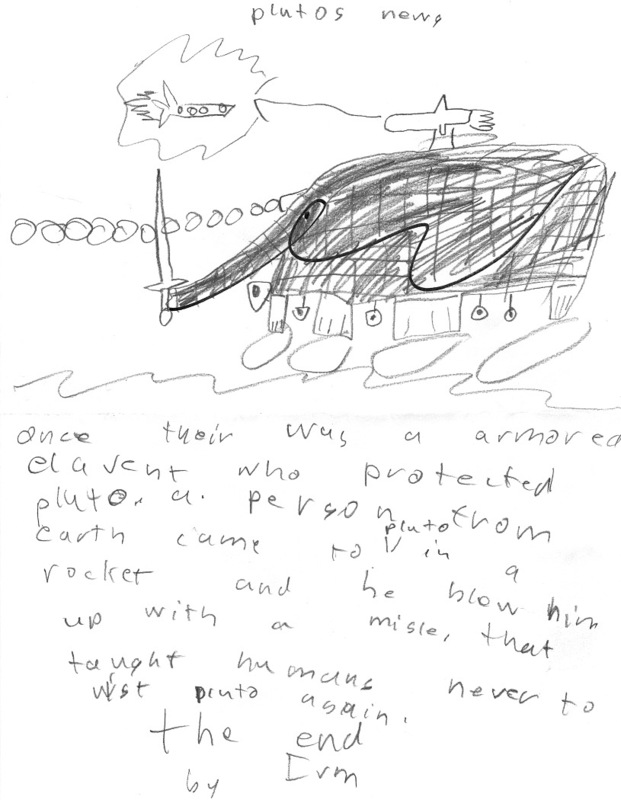 Once their was an armored elavent who protected pluto. a person from earth came to pluto in a rocket and he blew him up with a misle. that taught humans never to visit pluto again. 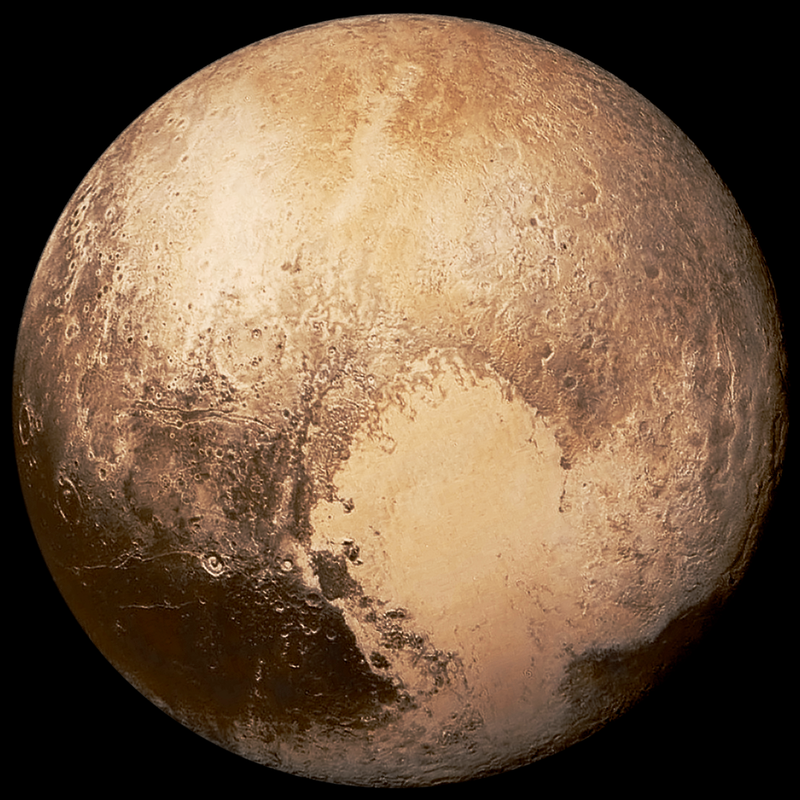 Small, demoted Pluto is 3 billion miles from Earth. It was the last unexplored planet in our solar system until 2015, when NASA’s New Horizon’s spacecraft did a flyby. Images revealed a surprisingly complex planet with a high level of geological activity, according to mission leader Alan Stern. 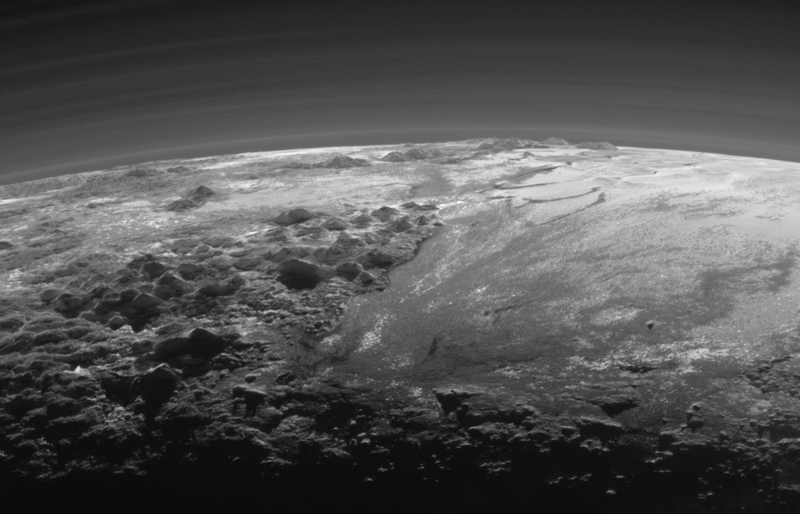 The image above reveals Pluto’s heart-shaped glacier as big as Texas and Oklahoma. NASA discovered that it’s a world of blue skies, mountains as high as the Rockies, and it snows—but the snow is red. The mission challenged scientific assumptions, and captivated the world–an unexpected, and equally important discovery, said Stern, co-author of “Chasing New Horizons” along with astrobiologist David Grinspoon. To create or discover new worlds–whether in the fantastical mind of a young boy or on the outer edge of our solar system–calls for action that is both beautiful and brave, a blind, courageous leap into the unknown. This burning drive to imagine the impossible, to see beyond the next mountain, to explore the darkest cave, to leave the Earth, defines us as humans. With the identification of a gene for restlessness, we wondered if scientists had found an explanation for our exploration. Some questioned that a single gene or even a set of genes could hardwire us for adventure. They argued that our large brains, nimble hands, legs built to walk long distances, and long childhoods, which provide plenty of time for exploration while being cared for by our parents, helped to create a species of explorers. The adult explorer has kept her playful approach to finding solutions for competing possibilities, and is comfortable existing at the edge of possibility, familiar with the work of chaos. Like space and the first draft of a story, natural caves aren’t straight forward (and down, in the case of caves), but meander, loop back, and dead-end. Spelunker shares terrain with space traveler and sci-fi writer. As seemingly farfetched and foreign as a missile-carrying elephant and red snowflakes are the caves of Boreno. Where Pluto is mystery made miniature, a place smaller than our moon, encapsulated in darkness and ice, Malaysia’s Gunung Mulu National Park is its opposite–mind-blowing voids and extreme humidity, reporter Neil Shea wrote in National Geographic. “The chamber was humid and warm, as though the darkness itself were wet, and beyond the edges of camp a constellation of little jewels glinted in the lamplight–the eyes of countless spiders, some as big as my hand,” Shea said, as he followed spelunkers charting new territory. “More than any other sport, caving is about secrets and the things we endure to find them out,” Shea said. 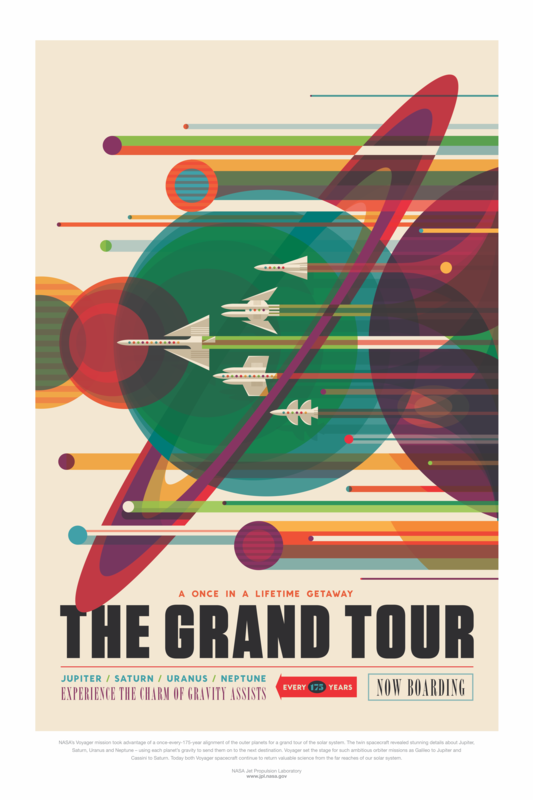 The explorer’s quest to discover, to know what is unknown, is illustrated in images like “Grand Tour” and “Earth: Your Oasis in Space,” which I shared above. 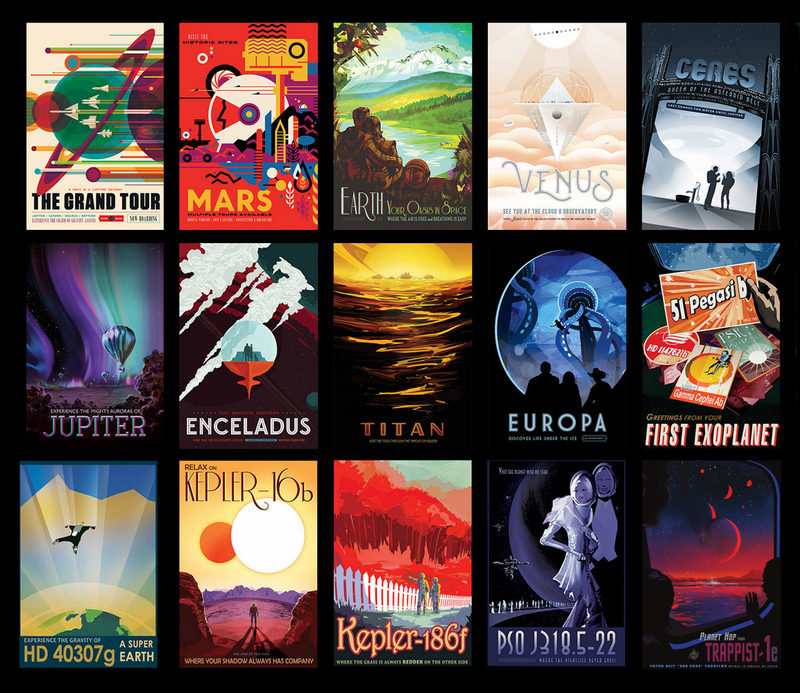 They are part of a collection of 14 posters created by NASA’s Jet Propulsion Laboratory to celebrate the discovery and study of exoplanets–planets orbiting other stars, of which 47 so far have been identified as sharing some of Earth’s life-sustaining qualities, such as rocky terrain, limited radiation exposure, and water in a liquid state. 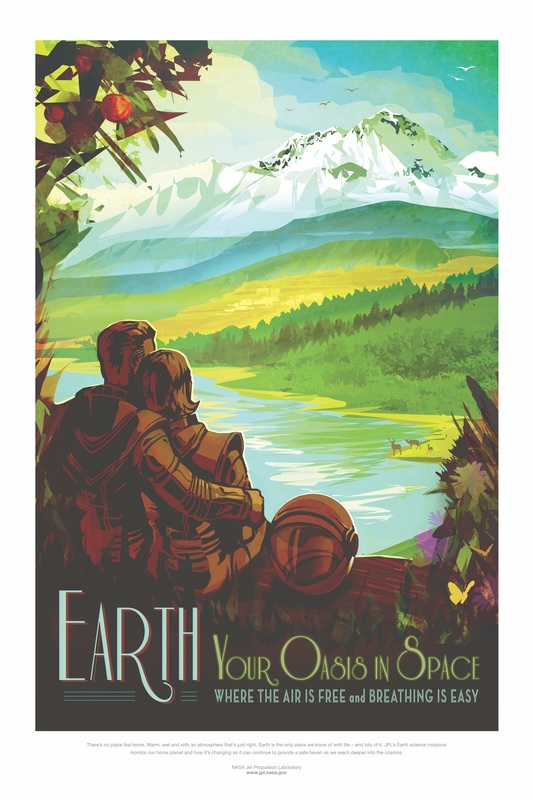 Old national park posters from the New Deal’s Works Progress Administration became the model for the space tourism posters, with today’s illustrators and designers, like their predecessors, drawing inspiration from the visual limitations. My curiosity was unquenched, but, with tea cold and eyes tired, I had come to the end. I closed book, magazine, and computer. My youngest son joined me on the couch to tell me about his day. I half-listened. My mind, like Carroll’s Alice, was filled with “curiouser and curiouser” thoughts, of spiders lurking in the glittery corners of the sky and elephants marching across fields of red snow. “Alice’s Adventures in Wonderland” by Lewis Carroll (public library). How to play the scribble drawing game. Pluto. Alan Stern’s interview and his book (public library). National Geographic reports on restless genes and caves under Borneo.